Time management, the art of working effectively and efficiently, is a life and death issue for project managers. It’s too easy, for both project managers and project teams, to become overwhelmed by the minutiae of project management processes and day-to-day crises and lose sight of the big picture. Once this happens, your project is doomed to fail. 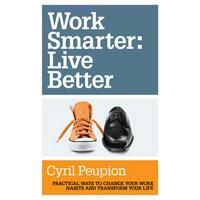 In Work Smarter: Live Better Cyril Peupion explains that “we are committed to our job and want to be good at what we do … But we do not always work effectively—we work hard but not always smart”. Most people have never been taught to how to, he believes, and so his book promises readers that they “will learn how to work smarter and more importantly live better”. The first part of the book outlines basic practical ways to manage your time and avoid time-wasters. Microsoft Outlook’s Inbox, Task and Calendar features are used extensively in this section to demonstrate how to implement the various strategies. However the book does make it clear similar products, such as Lotus Notes, can be used in the same way. Part 2 discusses the importance of not only working efficiently, but of being effective. The importance of defining your goals and linking them to overall business goals is discussed. These goals then form the basis of your regular quarterly, monthly and weekly planning. Finally, he emphasises the importance of ‘acting daily’ on your plans. There are no earth-shattering revelations in this book. What it provides are practical, proven, methods for managing your work, emails, calendar and tasks. The advice on setting priorities and focusing on the right things also draws on proven techniques, with several references to Stephen Covey’s First Things First. Experienced project managers are already good at this, but for new or accidental project managers this book is worth reading. If you’re struggling with an avalanche of emails, phone calls, and endless distractions, this book will teach you to bring order to chaos. Similarly, if your team needs better time management skills you can use this book to help them improve. Years of experience taught me to use similar strategies. But it’s easy to backslide and there are always new distractions. So, I’m off to review my goals, update my outlook rules and unsubscribe from all those ‘interesting’ emails. Joan Dobbie is a highly experienced program and organisation change manager with a passion for helping organisations realise their vision. As the founder of Beyond Strategy Consulting, she works with clients to transform their business by turning vision into practical strategies, successfully executing strategic change and producing outstanding results. Prior to starting Beyond Strategy Consulting, she held senior global and Australian roles at EDS (now HP) where she led a number of major organisational transformations. Joan Dobbie has written 3 articles for us.